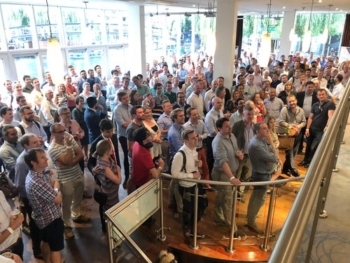 Thank you to everyone who came to the HFP Summer party last night. It was amazing to see over 200 people in one space, all sharing stories – see the photo below (click to enlarge) taken during the raffle draw. We will do a full article in a day or so. And congratulations to Max who won the business class flight to Abu Dhabi! Thanks again to Etihad Airways for their generous support of the event and for providing the raffle prizes. Starwood Preferred Guest and Marriott Rewards have launched some new concert tickets for their suite at the O2 Arena in Greenwich. This is not a bad place to see a concert, as Anika’s review here shows. The food and drink on offer is excellent, albeit you are some distance from the stage. This is a list of the concerts available, including some older ones which have not sold out. Availability seems to be separate across both sites, so if one site is sold out, take a look at the other. The SPG Moments home page is here. The Marriott Moments home page is here. Remember that the Starwood Preferred Guest American Express credit card comes with a sign-up bonus of 10,000 SPG points. These tickets will probably sell out before your bonus comes through, but you would have the points ready for when the next wave of tickets is released. My review of the card is here. Radisson Rewards – the loyalty scheme for Radisson Blu, Radisson RED, Park Inn and Park Plaza – has launched a double points offer. The registration page for the double points offer is here. You can learn more about Radisson Rewards on the Radisson website here. 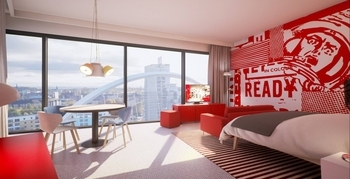 The photo above is a room at the brand new Radisson RED Glasgow. OT: Amex Plat Travel Insurance. I had my phone stolen on holiday and want to make a claim. The claim form is asking for cost and I presume next step they will want a receipt. The phone is a pay monthly phone which I probably paid £50 upfront for, what cost do I put as obviously £50 wont replace the phone. The cost to replace the device! Maybe if you explain it’s on contract and show a copy of the contract receipt and a screenshot + web address of this type of phone being sold on a website? When I dropped my phone on holiday and claimed they paid up very quickly after I sent the repair receipts. You need to prove ownership, and then prove the replacement value. All perfectly reasonable. You can send your contract invoice and a print from Amazon for replacement. I water damaged my phone on holiday it was only 3 week old I got 2 quotes from Iphone store. One for new one for refurbished. Amex paid out for new phone due to shorter guarantee on refurbished. great service. Does anyone know how long it takes for the welcome bonus of SPG AMEX to get credited into SPG account? Is it too late to apply for the card now if I want to get the points before 1st Aug? Nothing happens on 1st August. Nothing happens for 2 reasons – a) the Marriott / SPG changes are NOT 1st August, they are ‘some time in August’ and b) the SPG Amex continues and points transfers after the switchover just get multiplied by 3x. Points go across 6 days before statement date so if you signed up now and had a statement date of the 10th, the first lot of points inc the bonus would go across on 4th August and will be in the account on 6th August, give or take. Thanks Rob! Don’t know where I got the impression that the changes take place on 1st August. I’m 10K SPG points short to redeem the Travel Package so am hoping to get the points before devaluation. I’ve already maxed out on the point purchase. Marriott has actually said ‘1st August’ at least once in communications, but this is apparently not the case and they are now downplaying any attempt to have it live by then. As long as it goes live before my Venice stays in August, since Marriott resort hotels do not currently give free breakfast but will after the switch! Sorry but the SPG/Marriott thing has gone over my head. I have some SPG points from Amex that will probably be BAEC-bound but the flexibility is nice. Is the airline transfer option disappearing, and/or the 20+5k bonus? OT: Have the Gold Credit Card, used the normal link to upgrade to Platinum a month ago. It was “accepted” but the Platinum wasn’t posted because I can’t upgrade from Credit Card to Charge Card. That is annoying, has anyone else had this experience? As a Gold Credit Card holder, can I apply for the Platinum Charge and earn the bonus points? I think it was always assumed there might be issues trying to upgrade from credit to charge, what exactly was Amex’s response? OH has just applied to upgrade from gold charge to platinum charge, knowing it’ll probably be the last time we can do it and will probably have to apply for the Platinum from the get go next time and swallow the fee for a couple of months. No bonus as its per earning family and you have an MR earning card. you would get the 9k referral bonus from your Gold though. I’m trying to link my OH’s Amex reward account to SPG to transfer points across. It just throws up a message saying “sorry there has been an error!” , email address etc are all the same. The only difference I can see is on the SPG account she has no title but the Amex form asks for one. I have tried putting in Mrs but it makes no difference. Is this likely to be where its falling down? The SPG account is only around 7 days old. Four (or was it five?) zeros in front of SPG number? Thanks Genghis. Tried four zeros and the account is now pending. Linking takes about 24-48 hours for SPG. It was the recent promotion they had – fly X flights by the end of June and get a bonus. I can’t remember the exact details.I got 16,000 earlier this week. Have Marriott ended the platinum challenge? I called them and was told that they no longer offer it as of june 11th. Similarly, has their online support team all given up? I got an automated response saying theyd respond within 7 to 10 days, 13 days so far and no response. Yes, suspended (not sure if permanently or not) whilst the consolidation process is done. Great Do last night, thanks Rob and Anika for organising and nice to be with such a friendly and diverse bunch of point aficionados. As an aside, a Lloyds upgrade voucher popped into Mrs Yorkieflyers Avios account, I guess a few days ago, not checked recently but when well short of the £7k spend, certainly at least £1k short. I wonder whether they are clearing the decks before closure by disbursing vouchers early? My Virgin 2 x PE voucher also appeared in the last few days too.. End of yearly billing cycle is many months away albeit the MBNA have ceased of course.. Likewise – they must have processed all the upgrade vouchers upon the MBNA closure date. Long trip home to Dundee for me, but managed to see the RAF flypast today. Bonus! “So you have the Lloyds British Airways Mastercard. How’s it going today “. Thought it odd. I asked for more information and was told this is what the card is becoming and thought I should have heard by now as new T’s and C’s were sent out. She did advise me to telephone Avios as they are the link between Lloyds and BA. She gave me a phone number, and it goes to British Airways. I’d be surprised if BA had two competing branded cards in the same market — and the BA Amex has years to run i’d guess. There’s probably an exclusivity clause in their contract too. It’s not unprecedented though — ANA in japan has cards with multiple issuers, all promoted alongside each other on the ANA website. I have had a new set of terms and conditions arrive effective September including 0% fees with no mention of the avios rate changing. Yes I posted earlier – they have no date for any changes as yet, and will give 90 days’ notice when they do. Just had a survey from Hilton about a new credit card. Two options suggested. Not sure how much I can say as think they said not to tell, but both more generous than current card. One offers more points and the other a free night for hitting a yearly spend target. Both still retained gold Hilton for £10k spend in a year. What was the target for the free night? £15k for free weekend night and £20k for additional free night – however only on the “less generous” rendering of the card with only 1 Hilton point per £1 spend. Looks good to me – you’d be getting a 2 night weekend break each year at (if you pick well) a top Conrad or Waldorf Astoria. Fancy a free 2-night weekend break each year at, say, Hilton Venice? Considering you could spend it at a hotel costing c50-80k a night the effective rate on the 15k spend is pretty good c4-6points per £1. Is the 2nd night at 20k total or further 20k ie 35k total? I see it as £20k in total. This a country with an average salary of £27k ….. Interesting – a recurring free night option for hitting spend (a la IHG) would definitely be interesting. Interesting read of the survey. I had the same survey and had a strongly negative read, my reason being that Silver status (offered as base) is worthless, and the only worthwhile benefits (Gold status and a free night) both required very significant annual spend. I was at pains to tell them that I, and many others, had engendered a loyalty to Hilton off the back of their previous, generous, card; and that a less generous card would feel like a kick in the teeth and likely engender the opposite! Eh? The old card was the SAME as the first proposed version now – no annual fee, Gold for £10k spend, Silver for everyone, 2 points per £1, no long-term spend bonus. In fact, the proposed 5 points per £1 on Hilton spending makes the new card even better than the existing one. I used Marriott points (shared 45k with a colleague) and went and saw Quincy Jones at the O2 at the end of June. We arrived early, canapes were served in the private box. hot food was brought out just before the show. Open bar. the music was spectacular. lots of special guests in support of a true legend of music. it was a great night. the box holds about 20 people, but there were only 10 of us. great service from the hosts of the night. will be doing it again. Saw a review of that, the guest list did look impressive.